Jens Voigt has won the Critérium International five times, putting him on equal numbers with Frenchmen Emile Idée and Raymond Poulidor. This year, the German has the chance to make it six and become the sole record holder. After a late return from checking out the race’s decisive climb, the Col de l'Ospedale, Voigt sat down with VeloNation to talk about a race that he loves, no matter where it is held. The race has changed dramatically from its time in the Ardennes to its home this year on Corsica. "Before, the first day you always had a sprint," Voigt says. "But now, the race is over after the first day." Last year, that was the case when Pierrick Fédrigo won stage one and held on to the overall win. The 14-kilometer long final climb up to Ospedale at 6.2 percent is different than the previous Critérium editions. "But it is not impossible for me," Voigt insists. "The first part is relatively flat. In the town of Ospedale there is about a kilometer that is really steep." The gradient goes up to 12 percent before it flattens out again to finish near a big water reservoir. 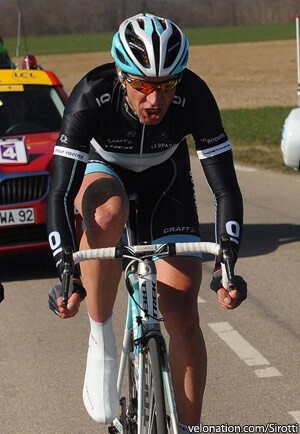 He will wear dossard 47 (Andy Schleck has 41), but says the race number doesn't matter. "We have multiple leaders here and you really don't need someone who works for you." Whoever feels strong will attack. He has no illusions that the deceiving race number will put him off the radar of his main rivals. 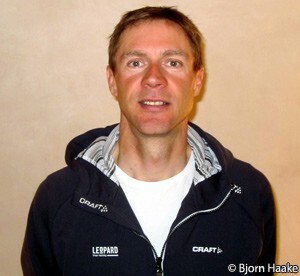 "I am 1.90 meters tall - no matter what jersey I ride in, they will recognize me." He sees his age as his main advantage. "They may say, ‘come on that old guy - we don't have to pay attention to him. Still 30 kilometers to the finish? Ah, we'll catch him.’" One thing is clear; Leopard Trek will be fighting tooth and nail for their next win of the season when the race begins. "It would be an understatement to say we would like to be 12th. It could happen of course, but it cannot be our goal. We want someone on the podium." The tactics will for Luxembourg’s new powerhouse squad will be refined during the traditional meeting in the team bus before the start of stage one. "Kim [Andersen] will tell us what he thinks and we will try to put the plan into action." The stage one route suits the team, with the constant up and down. "Everything that makes the race tough is good for us. It is an honest race. You only have to be good and you cannot hide." This is the way Voigt likes to race. He hopes to be able to hang with the climbers on the steep section and, if that happens, he feels everything is possible. "On the last climb, the legs will make the decision. In the end you just have to be strong and the strongest could win." Five times he has earned the title of strongest over the weekend. "I like this hard, short weekend, with the time switch as a bonus." On Sunday, the clock gets set forward by one hour, which makes it effectively an 8am start time. The packed action with three stages in two days suits Voigt. "You always have to be alert. I am very motivated for this race." He is rightfully proud to be a five-time winner of the event. "When you look at the winner's list, I am the smallest name in there. Sean Kelly, Bernard Hinault, Poulidor, [Jacques] Anquetil - I am proud that I was able to squeeze my name in there." Another win would make him the only record holder, ahead of the eternal Tour de France runner-up Poulidor. "Yes, that would keep the story alive. Oh, but that would mean I had to die before him, then he would be second again. No, I don't want that either," Voigt jokes. His form is arriving in time. "I had a rocky start to the season. We had a tough winter in Germany and it was not easy to get the hours together on the bike." He was also helping out his pregnant wife, with their sixth child who was born on January 8. In the final weeks, his wife had ultrasound and doctor's appointments in Berlin, where the winter came on full force. "Parking lots were frozen over and you just don't want a pregnant woman walk by herself there." The lack of hours on the bike resulted in a slower-than-usual start to the season. "I was able to get intensity training in, but I was lacking the stamina." At least he knew why his form was a little off in the beginning. "It would have been worse if I came to the races, didn't do well and wouldn't know why." Now he is hopeful that he can make the Tour de France team again. The list will go from the current 14 men to the final nine-man selection. Voigt knows that it will be a tough battle, in a new, strong team that was ranked number one from the beginning. He even sees some risk in that. "Everybody has hopes and expectations, but we need to fulfill those." Voigt compares the team's two victories (Fabian Cancellara and Dominic Klemme) to Rabobank's ten wins so far. "The Schlecks and Fabian will be evaluated after the Classics and the Tour. If they win fifteen races in the Mallorca Challenge but finish 85th in Roubaix and the Schlecks finish 55th in Liège then everybody will say 'That was bad'." Voigt knows that wins are difficult to achieve. "But at least you have to be prepared and ready to fight for victory." In his quest to make the Tour team, he will tackle the Tour of the Basque Country, the Ardennes Classics, the Frankfurt Grand Prix, the Tour of California, potentially the Tour of Luxembourg and the Tour de Suisse. 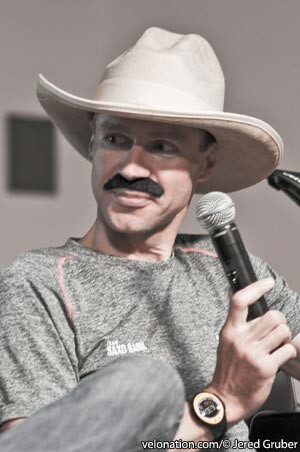 California is also always a highlight for him and he came close to winning in 2007, when he ended only 21 seconds behind Levi Leipheimer in second place. "There are very few riders - I think like 11 or 13 - who did all the Tours of California." The race goes into its sixth edition in 2011. Prepared to Voigt also means using the race radio. While four years ago, he was still hesitant about them, he has now become a strong supporter. "It is an essential part of my equipment. It is more practical. If I lift the arm the director thinks it is something serious. So he may come to the front at full speed, but you may have had something minor to say." "We live in the 21st century, of course we want to have communication. Imagine telling everyone that they have to go back to using maps, rather than navigation devices. Life has to become more exciting again. Nobody would take it seriously, but that's what happens to us cyclists." Voigt sees a different reason why races are becoming less exciting than they used to be. "The races are that way because the material is almost the same, everybody is fit and everybody has a reasonable training plan. Things like Bernard Hinault winning Liège–Bastogne–Liège by 12 minutes won't happen again. No rider is that dominant." But radios also don't prevent every disaster, as Voigt found out during the last Tour de France. The team had expected a strong attack right from the beginning, with stage 16 starting with the climb of the Cold de Peyresourde. So every rider took only one bottle, to save weight. The second team car was placed at the beginning of the second climb, to hand out needed refreshments. Over the top of the first mountain, Voigt was just behind the group of his teammate Andy Schleck. There are only two team cars in the race caravan per team. On the descent, Voigt's front tire exploded. He crashed, but it was not as bad as his high-speed crash one year earlier. Still, by the time he picked himself up only an ambulance, a commissaire and the broomwagon were left. The broom wagon driver was eager to get Voigt aboard, but the German wanted to desperately make it to Paris this time. "No way I will go home. I would have taken a horse to move forward." The kid's bike he received was way too small. "It would have maybe fit Cunego," Voigt says and laughs. "The gearing was restricted as is custom for junior races." Voigt had to ride like this for about 15-20 kilometers, then a policeman, who was instructed by directeur sportif Bjarne Riis, gave him a spare bicycle. He hopes this won't happen again. It is his first time on Corsica and he really enjoys the scenery. Plus he noticed something that can help prevent crashes, "The roads here are really good, almost like in Switzerland."